The Situ Gintung dam in Cireundeu, Tangerang broke on March 27, 2009 and killed at least 99 people (Kompas April 1, 2009) and still counting since there are about 100 people reportedly missing. The dam was built during Dutch colonial rule to contain water from the Pesanggrahan River. Several investigations have been conducted to identify the culprit of the of the Situ Gintung collapse. The Indonesia Technology Application and Research Agency (BPPT) revealed piping in the body of the dam (Kompas April 1, 2009). The piping allowed water infiltration into the capillary breaks that caused the dam collapse. The piping was identified in the month of December 2008. Situ Gintung Tragedy -another-, originally uploaded by aris-ressy. The heavy rain in the area of Situ Gintung was often blamed by many people as the culprit of the disaster. The heavy rain is only a trigger but is not a cause of the dam collapse. 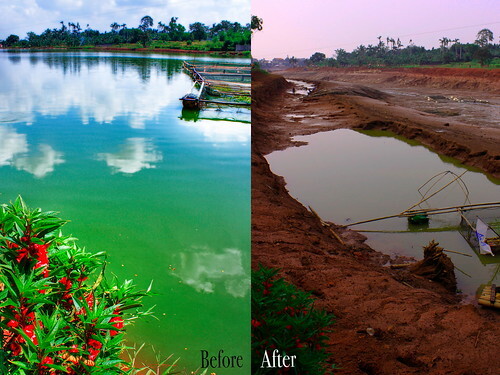 Heavy rains were often recorded in the Situ Gintung area, as happened in 2007 that caused big floods in Jakarta, but they did not break the Situ Gintung dam. I would argue that the collapse of the Situ Gintung dam was caused by the low enforcement of the spatial planning laws in Indonesia. Indonesia has had spatial planning laws since 1992 through the enactment of the spatial planning law 24/1992. This spatial planning law differentiated spatial plans by two main functions including conservation areas (kawasan lindung) and cultivation areas (kawasan budidaya). Conservation areas include areas surrounding springs and lakes such as the Situ Gintung area. The spatial planning law 24/1992 clearly stipulated that the conservation areas have the main function for protecting the environmentally sensitive areas such as areas surrounding springs or lakes. Activities that are allowed in the conservation areas are very limited including conservational and rehabilitation activities, research and environmental tourism. Referring to the spatial planning law 24/1992 or the current spatial planning law 26/2007, the Situ Gintung area was supposed to be a conservation area. Assigning the Situ Gintung area as a conservation area means only activities protecting the environmentally sensitive area of Situ Gintung will be allowed in the area. Residential areas will not certainly be allowed in the conservation areas including in the Situ Gintung area. The disaster of Situ Gintung is the impact or negative externalities of the activities in the area that cannot protect and conserve the environmentally sensitive area of Situ Gintung. More than 40 percent of the 112.5 hectare water catchment area of the Situ Gintung was identified as residential areas (Kompas April 1, 2009). Such a large proportion of residential areas in an environmentally sensitive area are clearly an indication of the low enforcement of spatial planning laws. It is very likely that the residential areas would expand in the Situ Gintung area in response to the population growth if the disaster did not happen. The current spatial planning law 26/2007, adding several clauses from the spatial planning law 24/1992 such as imposing administration and criminal sanctions for those who violate the laws, is poorly enforced. The new stipulations in the spatial planning law 26/2007 including disincentive and incentive in the spatial plan implementation have not been fully enforced. The violation of spatial plan law in the Situ Gintung area is only one of many violation cases in Indonesia. The Indonesian Planning Association also acknowledged the spatial plan law violations in other Indonesian cities in their press release in the aftermath of the disaster of Situ Gintung. The enforcement of the spatial planning law will be a difficult task without the understanding of residents about the importance and essence of spatial plans. Situ Gintung Tragedy, originally uploaded by aris-ressy. Indonesian people need some more time and efforts to “learn” the importance of spatial plan for the sustainable development in Indonesia. The disaster of Situ Gintung should be interpreted as a learning process for Indonesian people about the consequences of the spatial planning law violation. Indonesia needs to learn from the mistakes in the Situ Gintung case for preventing similar cases in the future. Indonesian people need to understand the importance of spatial plans for their public health, safety and welfare. Such an understanding is quite important for the Indonesian governments to enforce the spatial planning law 26/2007 in order to create safe, convenience, productive and sustainable places in Indonesia. interesting and tragic. I once constructed an earth dam at my hometown of Red Wing (Kepak Merah) Minnesota. Indonesia is on an active tectonic (volcanic) ridge and between two major weather systems. It is vital for the future that Indonesia retains substantial rainforest, mangrove and reefs, to prevent further floods. The engineers cannot construct a perfect dam (even concrete) if the forest is removed so the water flows too fast from the mountains, because it will simply flow over the other areas. When the forests are cut and burned, the soil washes away covering the coral reefs, and the mountains lose both the organic material and the groundwater. Hopefully, the urban and government policies will adapt a conservational outlook.